In my two months as a New York State Parks Boat Steward on Lake Champlain I have already collected two aquatic invasive species: the banded mystery snail and the zebra mussel. I encountered the banded mystery snail at two different boat launch sites by the shore of Lake Champlain near Point Au Roche State Park. The zebra mussels are often found attached to rocks, driftwood, and recreational equipment that has been in the water for some duration. The banded mystery snail is native to the southern United States and its introduction to this region can be traced back to 1867 when an amateur biologist released 200 of the snails into the Hudson River. This event was followed by subsequent introductions from aquariums owners. The snails can grow to be 1.75 inches long and 1.5 inches wide, with anywhere from one to four red bands on the shell. This species also lives in very high densities. Scientists are still studying the ecological effects of banded mystery snail invasion on natural communities. However, the presence of the species has been shown to decrease the survival rates of large mouth bass eggs in ponds and in the lab, which may eventually lead to a decline in fish populations in Lake Champlain. Zebra Mussels attached to a piece of driftwood at the Point Au Roche State Park boat launch on Lake Champlain. Photo by Megan Phillips, OPRHP. Photo of a Banded Mystery Snail collected from the Point Au Roche State Park boat launch, submitted by watercraft inspection steward Ariana London. Identification confirmed by specialists at SUNY Oneonta. The zebra mussel is an aggressive species that has spread very quickly since its first introduction to North America from Russia in 1989. By the mid-1990’s the species had become established in Lake Champlain. It is a D-shaped mollusk that is less than 2 inches long and has a distinctive brown zebra pattern on the shell. It poses great threats to native environments because it lives in dense populations of up to 750,000 specimens per square meter. Zebra mussels will attach themselves to any hard surface including native mussels, plants, man-made objects (such as piers and boat motors), and will even adapt to live on soft sediment. They are able to attach to objects by spinning a mass of tiny fibers called byssal threads that allow them to cling to any surface. Their larvae (veligers) are microscopic and float near the surface of the water which makes them easily transportable by boats or any recreational watercraft. Zebra mussels are strong competitors. One way that they outcompete native species is by grazing on large volumes of phytoplankton, thereby reducing the food resources available for native mussel species. They also take up large amounts of space on the lake substrate that is needed for fish spawning. Additionally, they cause drastic economic damage each year by clogging pipes and pumps at wastewater treatment facilities and damaging municipal drinking water systems, hydroelectric power plants and irrigation systems. 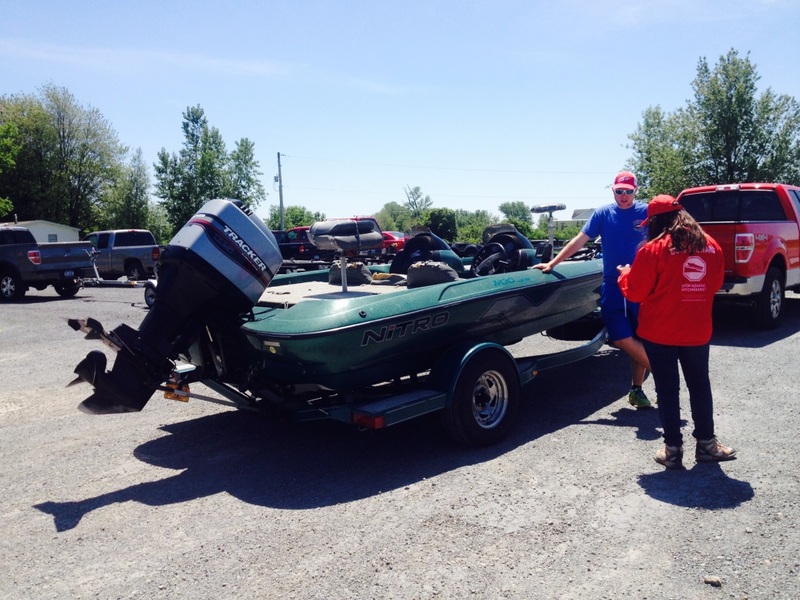 Ariana London completing a boater/angler survey about aquatic invasive species at the Great Chazy River Boat Launch (north of Plattsburgh on Lake Champlain). Photo by Megan Phillips, OPRHP. While it is possible that Lake Champlain may never be free of the zebra mussels and the banded mystery snail, we can still ensure that these species do not spread to ponds, lakes and streams that are not yet infested. I feel incredibly honored to be part of the effort to stop the spread of the aquatic invasive species by educating people on what they can do to help. Remember to clean, drain and dry your watercraft after use. To reduce the risk of spreading invasive mussels and snails in their veliger stage, boaters may opt to wash their watercraft and flush the engine with hot water. Research indicates that zebra mussels in the veliger stage cannot withstand water warmer than 110 degrees Fahrenheit, and adults will experience mortality at temperatures greater than 140 degrees Fahrenheit. For a list of hot water, high pressure boat washing station in the North Country/Adirondack Park area, click here. Post by Ariana London, OPRHP Thousand Island Region Boat Steward.